A very interesting start to a complex cycle. I looked outside my window and thought I saw a bird. 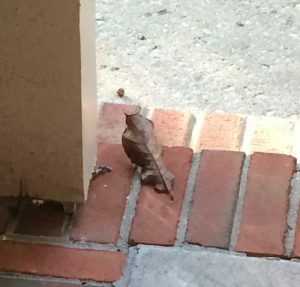 Up close…it was actually a leaf that looked like a bird. The first sound I encountered was the drilling of Woodpecker against the side of my house. As soon as I received the message “to be mindful of what’s bugging me and dig it out” the sound stopped. Things are not always as they appear…not as smooth and comfortable and lovely as what we see. Sometimes when we dig below the surface we fine a dirty underbelly if you will, and a growing discomfort and discontent with what “is”. I was finding in this cycle, both in the world and in my own life, limits to what will be tolerated. The time had come to turn the corner, make our voices heard and forge a new path. 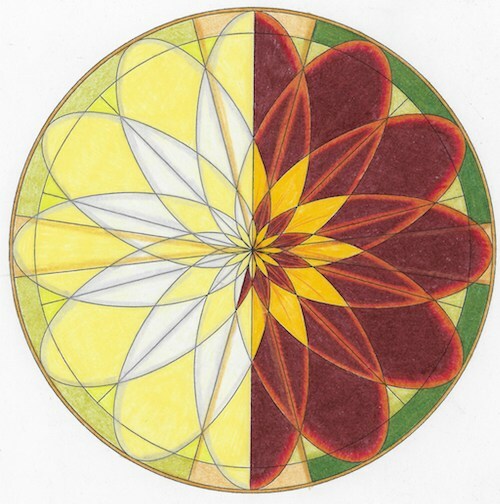 The mandala this cycle represents a life in full flower yet divided by a line drawn from north to south. It feels to me like change… the turning of a corner…the same yet not the same in some way. One chapter is completed and another begins. Yet more than a chapter is expressed here… a whole new phase…the next natural phase… something completely different is about to begin. Dramatic change is in the air. Three concentric circles at the outer edge frame the mandala covered in sections by the cross that intersects them. Four lines cut to the outer ring forming a cross… Though the cross has a resurrectional quality, it speaks to me of being “servant”…always have been… always will be. While visiting my friend in Indiana last cycle, we had dinner with some new friends of hers at a music ministry event at her church. As I sat across the table from one of the choir directors, I said to myself, ‘I used to be like her… very upbeat, bubbling over with excitement and enthusiasm.’ I find these days that I am but a mere shadow of my former self. Exhausted most of the time, I find it difficult to “catch my breath” energetically speaking. This new moon, exact on my ascendant, felt to me to be a reset button. 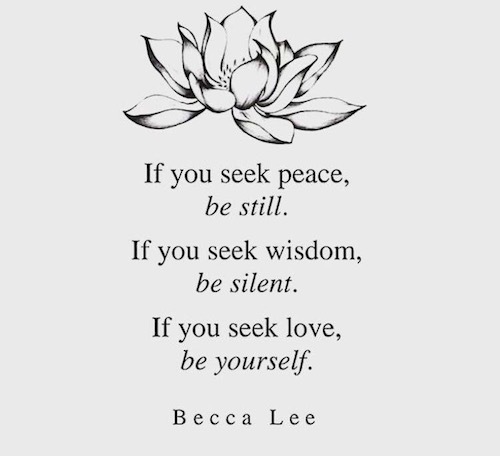 A time to step back and assess who I am, what I can live with and what I cannot tolerate. With the events of this cycle I questioned my own integrity… To speak out where I could for the sake of truth as I saw it…and when my words were but mere dust in the wind to step aside and forge ahead in a new direction. It has been a cycle of tremendous struggle, challenging conversations and heartbreaking decisions. In yet another case, it was just about letting go and inviting others to join in the responsibility which in the end is actually rejuvenating the group. Actually, quite fun to watch! 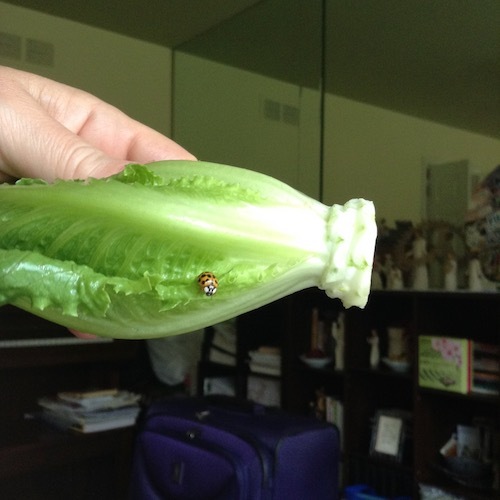 There is nothing quite like the simple joys of life to brighten a day… like finding a ladybug while cleaning a head of lettuce and setting her free, like strolling for hours in the beauty of nature… like the company of friends and family who care and support us during our trying times. In the final days of this cycle I am grateful for a free, online course by Donna Iona Drozda where she guides us to be mindful of the circadian rhythm and to Progress without Pressure. No doubt in my mind that God led me to her at this crazy time in my life. Each of us must choose how we will function in this world. Will we be messengers of the darkness? Of doom and gloom? Or will we strive to be messengers of light with substance and grace? A daily and sometimes moment-to-moment challenge to be sure. Sometimes its just about stepping aside so others can be who they are. The important thing, is to be who we are in each and every moment… to be true to our conscience… aligned to God’s hope for our life. 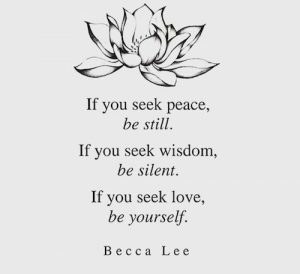 As for me, it is time to take a step back, press the pause button, burrow this seed called “me” into the dark, deep, rich earth where I can catch my breath and see where and how the Divine Beloved is moving in my life.